This is my foster dog Lele. She has a story to tell. But she only speaks dog. Therefore, I will use my human brain to read her chihuahua-mix mind and tell it for her. Once upon a time, there was a chihuahua mix running at large in the beautiful city by the river--Richmond, Virginia. One day--thanks to a citizen's tip, or a coincidental drive-by, I can't be sure--Officer Muller, of the award-winning municipal shelter, Richmond Animal Care and Control, rolled up, carefully parked his truck (so not to spook, or drive over the 10-lb wisp), got out, and scooped her up to safety. 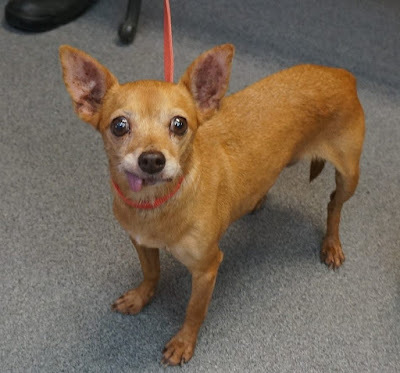 After a thorough exam (or two, three...), the little dog--who had by then been named Leona Lilly by the shelter staff--was diagnosed with a hernia, and was promptly scheduled for surgery to repair it. Leona Lilly then spent a delightful six weeks in a loving foster home--recuperating and waiting for a new, forever family. When that family arrived, she went on her merry way, to live out a life befitting a (mostly) toothless (that part of the story remains a mystery), senior girl (she's 10-ish years old, based on educated guesswork), who was once lost and with hernia. It was a typical day at the shelter, when the door chimed open and in came Leona Lilly and her adoptive family. Except Lilly was nearly unrecognizable--her balding coat covered in greasy patches of crusty scales. Broken, in body and spirit. Lilly's way had not been so merry, after all. "The dog you adopted to us is sick*," said Lilly's person, unwilling to provide any further explanation. "We're here to return her; she's not the pet we were looking for." They'd not stick around to second-guess their decision. So, little Lilly was once again scooped up to safety. Not with a hernia, but with a whole host of other mysterious issues that would prove less easy to fix. * Lilly had never shown any sign of a skin disease (nor any physical ailment, besides the hernia) in her initial shelter stay and foster home. Fast forward a week or so. "I'd be happy to foster Lilly, as long as she's OK with my corgis and cats," I typed in the email to the shelter foster care coordinator, after seeing her plea and Lilly's soulful eyes on Facebook. 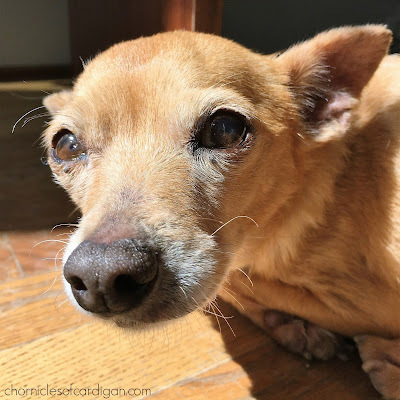 I'd never dealt with a dog who had significant skin issues before, but after just fostering a little dog with epilepsy without issue, I was eager to try. I mean, the bathing was only once a week, and I had loads of experience squirting stuff in cat** ears, I reassured myself. How hard could this be? TUNE IN NEXT MONTH FOR PART TWO OF THE STORY. BUT DON'T GO YET. I'M HERE TO GIVE YOU HOPE. So, Lele (shortened version of Leona Lilly) is in foster care in my home, now. She's been here for over two months. And although she still has lingering physical issues: yeasty, crusty skin (between baths), an icky right ear, and itchiness, which we combat with medicated baths and other topicals, there's great news: her spirit is fixed! We "super-glued" it back together with love, affection, several soft, chi chi-sized beds, furry companionship, outdoor supervision, playtime--not with toys, but Lele LOVES to play keep-away with me, zooming around in bursts of energy, especially after coming in from outside, car rides, and healthy, flavor-packed food. Lele loves to eat. I mean, she can hold her own against my perpetually starving corgis in that department. But it's not easy to find proper food for a scaly, yeasty, crusty, stinky, itchy little dog...with three and a half teeth! 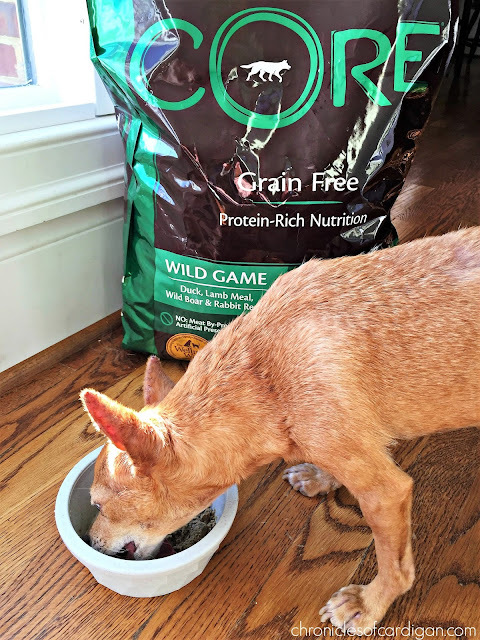 THANK DOG for Wellness and their natural, grain-free (and in our case, also potato-free), high-quality-protein-rich Wellness® CORE® line of dry dog food! I love it so much, I could squeal! Check it out! 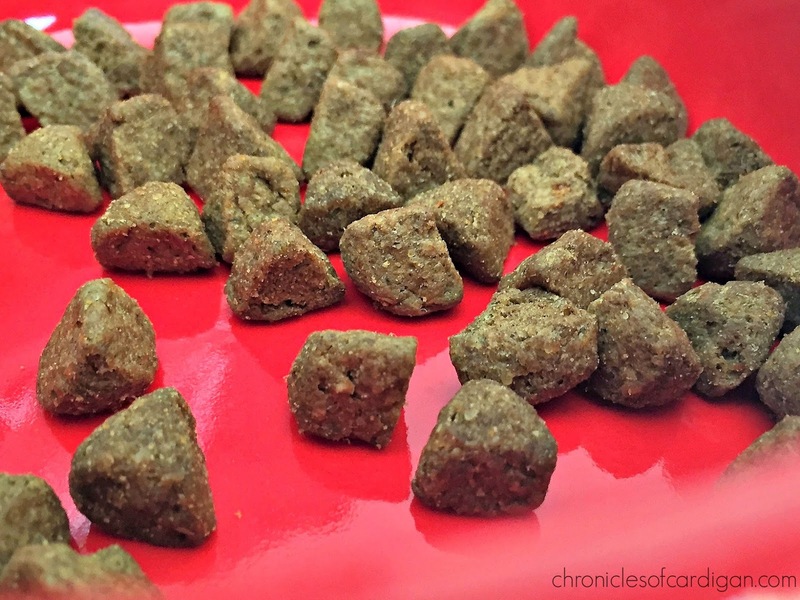 The small, pie slice-shaped kibble is porous, softens quickly in water, and packs well in a measuring cup. I hated feeding Lele kibble that was not only too big for her little mouth, but even after being steeped in water for several minutes, was too hard for her few remaining teeth to chew. She ended up swallowing a lot of her previous brand kibble whole, which was no good for her digestion or quality of life. I like how it packs so tightly into her 1/4-cup sized meal servings, too! It's rich in high-quality animal protein. 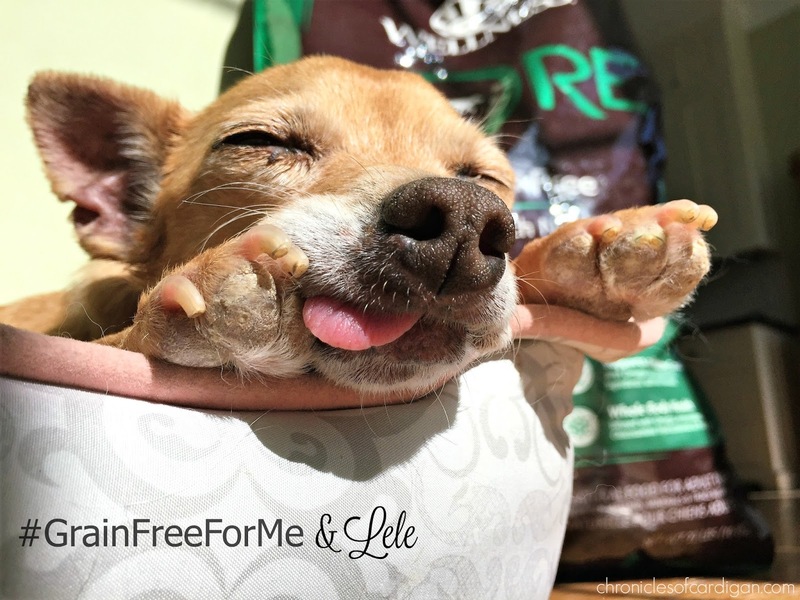 Lele is a senior dog, and current research supports feeding senior dogs a high protein diet, to ensure their bodies process enough of it to support healthy bones, joints and immune systems. Speaking of healthy, the food is packed with nutrients, added antioxidants, omega fatty acids, glucosamine and probiotics. And of course, never any meat by-products, fillers, corn, soy, wheat-gluten, or artificial preservatives, colors or flavors. It's grain and potato free. It's for sale locally in lots of places. Not in the grocery store, but at at places like PetSmart and the local, family-owned pet store. I need to be able to run down the road and get this, and not worry about the brand being exclusive to certain geographical regions or stores, as many premium pet foods are. I've also purchased the CORE brand online, at in-store prices. Lele BEGS for the stuff. 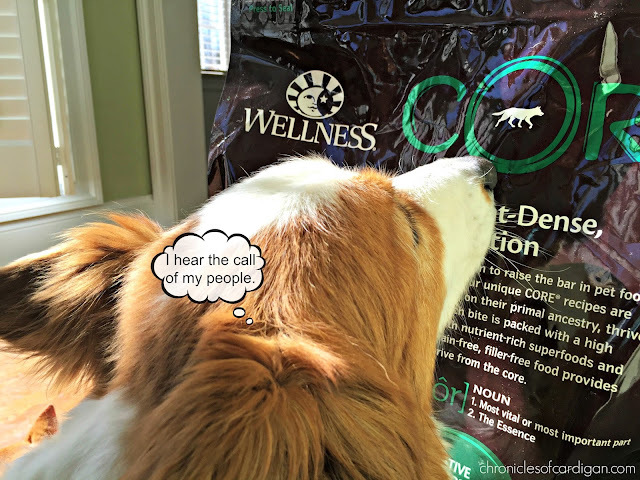 PROTEIN-RICH DIETS ARE NOT FOR EVERY DOG; there's also Wellness® Complete Health™ Grain Free. In case you've gotten as excited about Wellness CORE as I am, know that the high protein levels might be too rich for some dogs. And as always, pet food switches should be done gradually, over time. If you're interested in switching your dog to grain free, but not sure about the rich protein in CORE, consider the Wellness Complete Health new, GRAIN FREE line. Each of the three recipes provides a balanced blend of quality proteins, grain free carbohydrates, select fats and nutrient-rich fruits and vegetables. 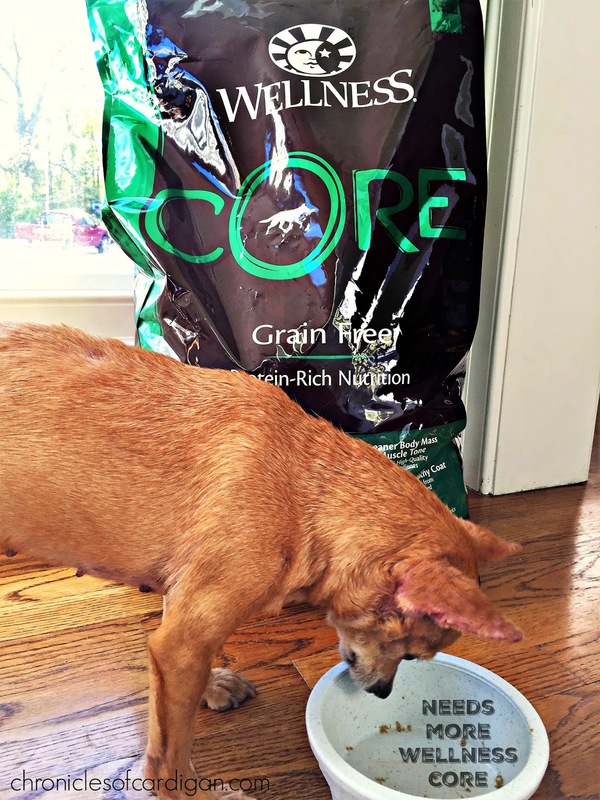 Bonus: the kibble in Complete Health Grain Free is the same packable, porous, little "pie slice" as with CORE! I'll be back in a month with the outcome of Lele's visit with the veterinary dermatologist, more information and updates about her Wellness CORE diet, as well as other things we're doing to get Lele 100% healthy again! Jon Farleigh barks at picks out dogs on TV, too. And, in case you wondered, he and Dewi are getting some CORE (Ocean Formula) in their meal rotations. They're thrilled. How do you spoil your pet? Lele has had a hard life! I'm glad she's with you and on a path to a better permanent home! It's great you found a food that works for her... and her teeth. Mr. N never had trouble eating big kibble but I know some some small dogs have issues with it. Sweet Lele is one lucky little dog to be fostered by you! Now if only they can figure out her allergies. Can't help but wonder what really happened with that adoptive family. BRAVO! Love reading happy ever after stories and what a lucky dog that you stepped in for her. So glad it's working so well for her... and boy is she a cutie patootie! Oh my goodness what a story Lele has to tell. But throughout all the sadness of it is the best part - she found someone special like you to turn her life around. THanks for the wonderful story! I'm sure she's now in the best possible situation full of love and yummy kibble! Oh poor baby! But, what a wonderful story. I love happy endings and it sounds like with all your love and good food she is on the right road! 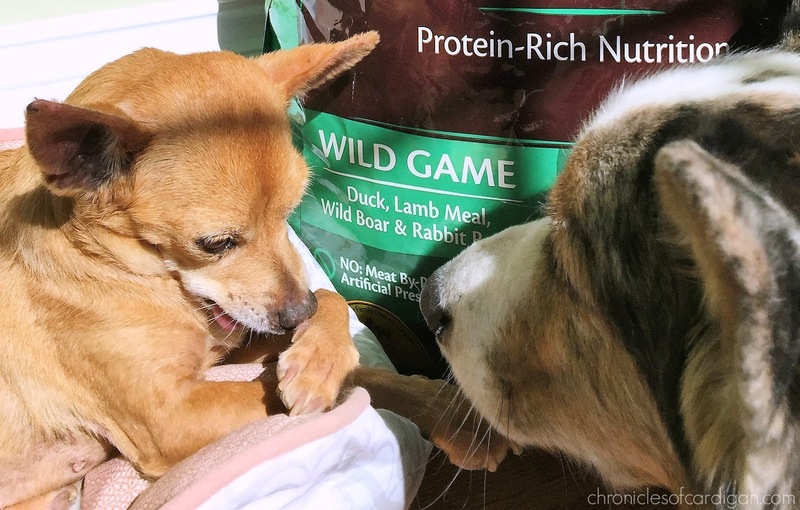 Truffle and Brulee eat Wellness canned food all the time. The closeup of her in her little bed was tugging at my heartstrings. I can't even comprehend how people can justify some of the things that they do. Itchy skin should warrant a trip to the vet, not 3 months until baldness, then back to the shelter. Ugh. So glad to hear this sweet thing is getting the love she deserves! How wonderful Lele is living a happy life now. Wellness sounds very good, thanks for sharing all the info! Lele is so cute! I'm glad she likes the food and is doing better. Thanks for taking such good care of Lele - I'm glad she is doing better and regaining her spirit. This sounds like a wonderful choice for Lele! I'm so glad that she found her way into your home, but I do hope her skin condition clears up and she starts feeling comfortable in her own skin soon. Hahahahaha - this was so cute! What a fantastic post, both the Wellness review and sharing Lele's story. I'm so glad she's safe with you now, I know you'll take great care of her and clear up all the nasty issues. Poor little girl, she's been through so much! I look forward to updates on Lele.